Coasters are essential to keep around the house - and they also make the perfect gift. Start here to choose from nature-themed wooden coasters, go with the simplicity of the bamboo coaster, or browse our other must-have coasters. 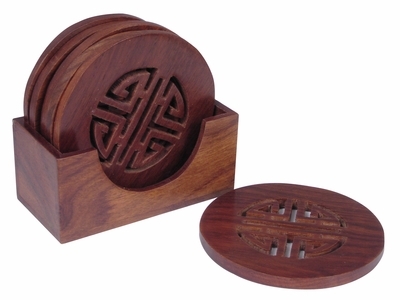 Have you ever considering using bamboo coaster as wedding favor? Or mixing and matching coaster types for an eclectic look? There's no limit to the creativity - and practicality - of having several sets of wooden coasters and asian inspired coasters to choose from. If it's time to update your coaster set, take a good look at your tableware. Wooden coasters match perfectly with just about anything. They will bring out the best in a Japanese Sushi Set, look classy beneath your Yixing Teaware, and coordinate just right with just about any tableware collection. Not to mention the fact that wooden coasters for drinks protect from discoloration and moisture rings that can ultimately harm your table. Before you let that happen, shop here to update your coaster collection and while you're at it, let our affordable prices motivate you to purchase an extra set - you're table can always use it! We've even got Japan wooden coasters - a bit hit with customers.